The makers of “Alpha and Omega” forgot that someone has to sit with the targeted wee ones they are aiming for. Any adult with such a task, might want to think twice about subjecting themselves to this uninspiring and rote animated feature. That child deserves better and will be thankful one day. They can easily skip out on a slapstick rom-com in the woods that doesn’t stick to anything. Not even the addition of the undying and overused 3D element can help this family film from falling flat. The setting is The Great White North, specifically Jasper National Forest in the Canadian Rockies, where two wolf packs strive to survive. 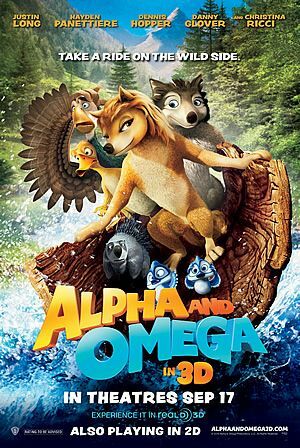 The two main anthropomorphic leads are the carefree omega wolf, Humphrey (the carefree Justin Long) and leader-in-training Kate (Hayden Panettiere cuz Drew Barrymore was busy), the responsible alpha wolf. Both have been friends yet they are expected not to associate with each other due to their expected dispositions. It’s the whole “wrong side of the tracks” storyline that’s been done to death, making the movie seem quite dated and unoriginal. The two wolf packs have had a long-standing bickering war fighting over territory and caribou and now near war is imminent. Elder leaders of these packs, Tony (the late Dennis Hopper, sadly, in his final role) and Winston (Danny Glover, in full “I’m getting too old for this” mode) conspire an arranged marriage for Kate to hook up with hunky alpha wolf Garth (Chris Carmack, now filming “Shark Night 3D”). Of course, she doesn’t love him but her younger sister-wolf, Lilly (Christina Ricci) has his scent. Yet before Kate’s annoying mother (Vicki Lewis) can plan the wedding, both Kate and Humphrey are drugged by rangers who relocate them to Idaho (Huh? Is that legal?) to repopulate another park. Talk about forced unions! Upon realizing where they are (don’t ask how they know Idaho or how they can read a sign that says Sawtooth National Recreation Area), the two forbidden love hounds work together to get home, expecting their elders will create a mess with them gone. Hilarity ensues as two annoying characters, a French goose named Marcel (Larry Miller) who plays golf and hates cupcakes and a duck named Paddy (Eric Price), his caddy. Will these two wolves get together as they make their way back to the pack and unite all? Is there anything else to this story? No. The film was co-directed by Ben Gluck (“Brother Bear 2”) and Anthony Bell (“The Boondocks”), created in India and distributed by Lionsgate, because every studio must have a CG/3D animated film. What we get is a bland movie, providing repetitive action scenes, routine antics and drowsy dramatics. The background animated scenery is anything but breathtaking and hardly feels completed. That’s sad considering the environment and the technology available to animated films now. Maybe the budget and expectations were too low. The filmmakers could have compensated for that by created a script that injected any semblance of originality and creativity. Not the case here, the story drags its paws and the dialogue drools drab lines. Most annoying and off-putting is the mating sequence, called “howling”, where a couple of wolves will hook up on an inspiration point and bark at the moon. Ugh! Listening to these cheesy crooning is more painful than watching American Idol auditions. It’s just stupid and annoying. I kept thinking why arent’ the wolves acting like wolves and realized it was pointless to even entertain such a thought. I suppose some kids would enjoy it but I didn’t hear a whole lot of laughter in the audience I was in, not even from my four year-old daughter sitting next to me. I would have either gone for more nuttiness or a straight-up Watership Down approach, but this middle-of-the-road pandering was just awful. Hey, at least there was no environmental message here. As expected, the 3D boost is utterly pointless, bringing little dimension to the forced fun. Save this one for a Mommy and Me rainy day at the local mutliplex in a couple months. I’m glad I saw it for free with my family, cuz family time can be fun no matter what you do. On the drive home though, I smiled when my daughter asked my wife and I from the back seat, “Tell me what part of the movie I liked?” There ya have it, out of sight, out of mind. You can’t excuse a movie like this by saying it’s just for kids since they know quality just as much as you should. it’s highly doubtful….if there is, it would be direct to DVD.